Just listened to an interesting Guardian tech podcast about interactive fiction or online storytelling. 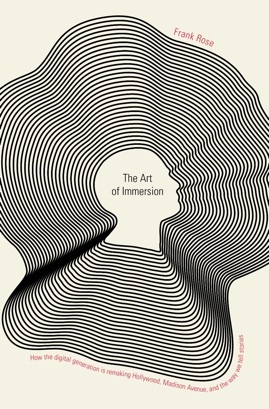 Wired editor Frank Rose has written a book called The Art of Immersion. Whether it is classics like the way Lost built such a convoluted story that fans were driven online to discuss it, or how Mad Men fans built twitter characters like Betty Draper. But both of these are extensions of a serial (or somewhat serial in the case of Lost) traditional series. More interesting to me are the experiments that change the fundamental base story. This means not taking a series online like The Spot (1995-97), but more stories that are part generated by an online community. Online Caroline (2000) – Early experiment using database-driven, templated responses to a video story. Although the site is down, there is a lot of commentary still online. Such Tweet Sorrow (2011) – Great British remake of Romeo & Juliet set in modern day UK, but told through twitter over about a month. Because the characters are in a public forum, fans were able to riff off story lines and engage directly with the characters.